Typogram is a free Windows 8 photo caption app available under ‘Photo’ section of Windows 8 app store. This photo caption app for Windows 8 lets you add awesome captions text to your photos. There are more than 55 different fonts, 45 palette colors, and seamless text formatting features. Once you have added captions to your photo, you can now save it in your local machine. As you open this Windows 8 photo caption app, you will be asked to upload a photo in which you want to add caption ? input caption text in the box given at the bottom and click on ‘Post’ to add the caption on the image. You can also change the font type and color of the text. For this, you need to use the dropdown button at the top of the screen and the ‘Color Brick’, respectively. Also, you can delete the caption by selecting the caption text added on the image and clicking on ‘Delete’ button. Once you are done with the editing, you can now save it in your local Windows 8 library. Below given are the key features of this photo caption Windows 8 app. Lets you add awesome captions text to your photos. There are more than 55 different fonts, 45 palette colors, and seamless text formatting features. Lets you save captioned photos in your local machines. Lets you delete captions easily. Well.. it’s a good fun photo caption app for Windows 8 that lets you add caption very easily. It’s a must-have app for people who love adding captions on photos and make the photos rememberable. Also, check out our posts on Photo Editing Apps, and Skitch App for Windows 8. You can now move further with upcoming downloading steps. 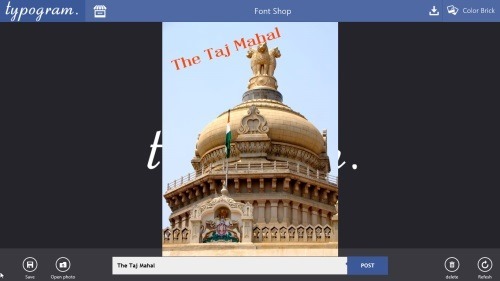 In short, Typogram is a useful photo caption Windows 8 app to add beautiful captions on your photos. Describe them, input the place where it was taken, add date on which it was taken, and much. Go ahead and download Typogram app in Windows 8.